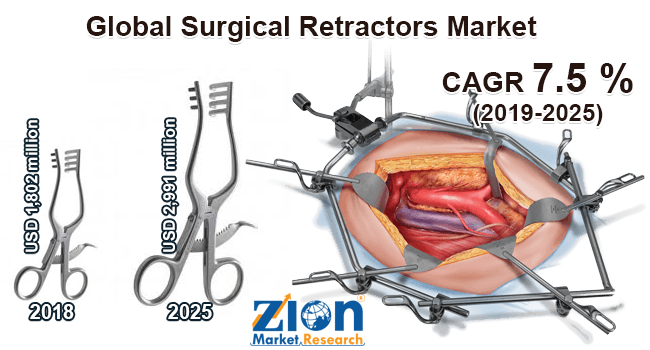 Global surgical retractors market expected to generate around USD 2,991 million by 2025, at a CAGR of around 7.5 % between 2019 and 2025. Surgical retractors are specially designed devices that are used for efficiently performing surgical procedures to hold the incision, tissues, and organs and provide a clear view to the surgeon. The report covers a forecast and an analysis of the surgical retractors market on a global and regional level. The study provides historical data for 2016, 2017, and 2018 along with a forecast from 2019 to 2025 based on revenue (USD Million). The study includes drivers and restraints of the surgical retractors market along with the impact they have on the demand over the forecast period. Additionally, the report includes the study of opportunities available in the surgical retractors market on a global level. In order to give the users of this report a comprehensive view of the surgical retractors market, we have included a competitive landscape and an analysis of Porter’s five forces model for the market. The study encompasses a market attractiveness analysis, wherein all the segments are benchmarked based on their market size, growth rate, and general attractiveness. The study provides a decisive view of the surgical retractors market based on product type, application, end-user, and region. All the segments have been analyzed based on present and future trends in the market are estimated from 2019 to 2025. Based on product type, the market is segmented into self-retaining, wire, handheld, and table-mounted. By application, the market includes cardiothoracic, OB/GYN, abdominal, orthopedic, and aesthetic. Based on end-user, the market is segmented into specialized clinics, ambulatory surgical centers, and hospitals. The regional segmentation includes the current and forecast demand for North America, Europe, Asia Pacific, Latin America, and the Middle East and Africa with its further divided into major countries including the U.S., Canada, Germany, France, UK, China, Japan, India, and Brazil. Some key players of the global surgical retractors market are Johnson & Johnson, Invuity, Inc., Medtronic, Terumo Corporation, The Cooper Companies, Inc., Henry Schein, Inc., B. Braun Melsungen AG, Stryker Corporation, RTI Surgical, Inc., Arthrex, Inc., Integra Lifesciences Holdings Corporation, Teleflex Incorporated, Globus Medical, Inc., Becton, Dickinson, and Company, and Medline Industries, Inc.